Sage 100 and Sage 100cloud news and technical articles of note. Beginning with Sage 100 version 2018 there is a newly updated version of payroll. Known as Payroll 2.x, this version is only compatible with Sage 100 version 2018 and higher. Sage just updated their compatibility chart to show which versions of Sage 100 remain compatible with various updated to Payroll 2.x. Sage 100 2019 was released on April 2, 2019. Below is the compatibility chart showing which releases of payroll 2.x are compatible with Sage 100 2019. This chart applies to both Sage 100 2019 and Sage 100 2019cloud. A separate payroll subscription is required to use payroll. Users of Sage 100 2018.x should use the following chart to determine which releases of payroll 2.x are compatible with their Sage 100 2018 release. Before installing any Sage 100 release ( or product update ) please check with your Sage partner. Ensure that any non-payroll integrations are also compatible with the new release. Kick off Sage Summit Atlanta right by joining us for Summit After Dark at Red Phone Booth! Red Phone Booth is a prohibition experience featuring an exclusive cigar program and a turn of the century craft cocktail selection. Red Phone Booth is located in the iconic Dailey’s building in downtown Atlanta, a short 4-minute walk from the Hyatt Regency Atlanta. This social event is a great opportunity to meet other conference attendees and is open to customers and consultants. To register visit Summit After Dark – Atlanta. Where Can I Find The Manuals For Sage 100 2019? Sage 100 version 2019 was released on April 2, 2019. Along with that release, which included an update to payroll and product update for version 2018, Sage also published updated product guides. 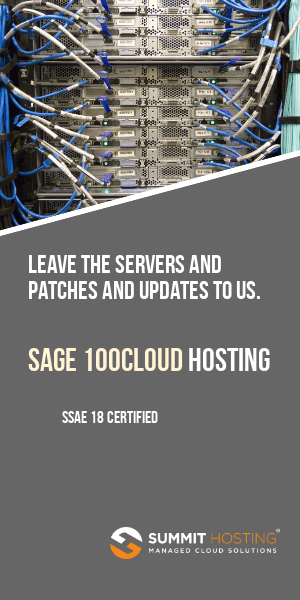 These update guides spotlight the features new to this release of Sage 100 and Sage 100cloud. Sage has also updated their Supported Platform Matrix ( aka SPM ) which specifies which hardware and operating system platforms have been tested and proven compatible with the latest Sage 100 release. To access the Sage 100 release guides for 2019 visit this link. Sage has also updated their online manuals for their Sage 100 2019 release. These are the same guides accessible from within the Sage 100 product. To access the Sage 100 2019 manuals online visit this link. Sage just updated their supported platforms matrix for the following Sage 100 and Sage 100cloud versions. The Supported Platforms Matrix, also referred to as the SPM, outlines the network operating systems and the minimum configurations of memory and processors required for Sage 100 usage. The SPM is updated at least annually and can be downloaded directly from the Sage site here. Important Reminders: Windows 7 Extended Support from Microsoft ends on January 14, 2020. Windows 7 will no longer be supported by Sage after January 14, 2020. Windows Server 2008 R2 Extended Support from Microsoft ends on January 14, 2020. Windows Server 2008 R2 and Windows Small Business Server 2011 will no longer be supported by Sage after January 14, 2020.